One of our favorite ways to decorate includes repurposing vintage or antique finds into new, purposeful and beautiful storage solutions. We’ve [transformed an old storage trunk into a TV stand on castors](http://www17apartcom/2013/03/before-after-from-throw-away-trunk-tohtml), breathed new life into an old army locker by [repurposing it into a kitchen console](http://wwwehowcom/new/before-after-army-locker-rises-battle-again/) and just this past summer we stumbled across a beautifully worn, well used industrial ladder at an alley sale in our neighborhood that we couldn’t wait to put to work. It had [an amazing story and was filled with local history](http://www17apartcom/2013/07/ladder-blanket-storagehtml) — so much so, we couldn’t pass it up. Not knowing exactly what we’d do with our new-to-us vintage find, we were eager to work it into our home decor. We ended up propping it against a formerly empty wall in our living room to not only act as storage for the [throw blankets](https://society6com/throw-blankets?utm_source=SFGHG&utm_medium=referral&utm_campaign=3784) in regular use, but to add a little vertical dimension and decorative interest to our space. 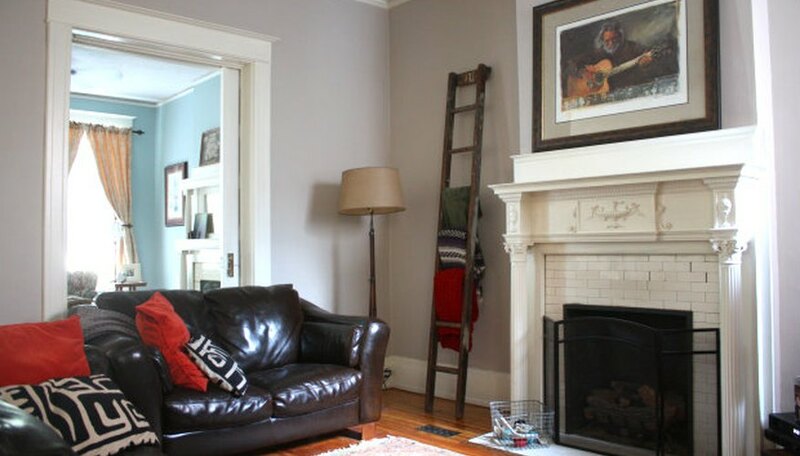 While we ended up using _our_ ladder for blanket storage, there are endless ways old ladders like these can be used as decorative (and hardworking) storage solutions around the house. Today we’ve rounded up our 5 favorite ideas for repurposing ladders into functional storage pieces that add a beautiful decor element to any room. Create a little decorative display while keeping your space organized at the same time. From blankets to books and magazines, a ladder simply leaned against an open wall makes for instant storage and vertical dimension in any room. _I__mage sources: (http://wwwdrivenbydecorcom/2012/09/25-unique-ways-to-decorate-with-vintagehtml), (http://wwwapartmenttherapycom/think-outside-t-141321), (http://wwwvtwonennl/wooninspiratie/ladder-als-nachtkastjehtml), (http://wwwlauraseppanencom/)_. Leaning ladders are perfect for adding a little vertical dimension in tight spaces like the bathroom where long towel racks aren’t always an option. 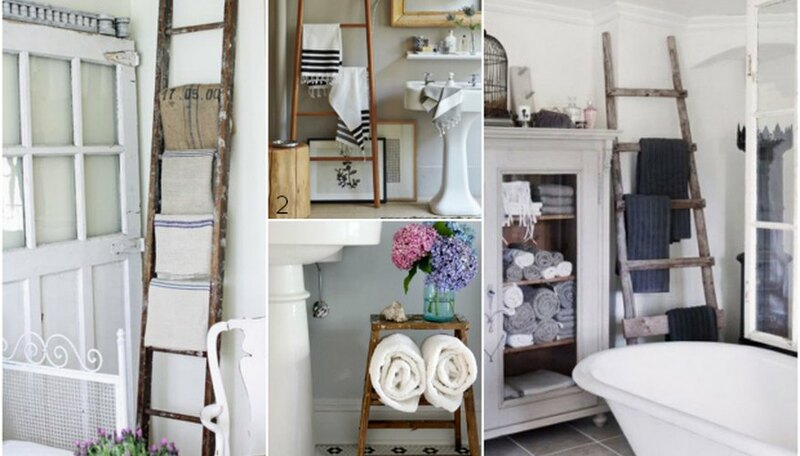 Use the ladder rungs to easily stack and layer towels, basket storage and other powder room essentials. _Image sources: (http://wwwhouzzcom/ideabooks/1057661), (http://wwwbobvilacom/articles/diy-with-vintage-ladders/), (http://eclecticallyvintagecom/2013/08/vintage-step-ladder-bathroom-storage-ideas/), (http://wwwshelternesscom/43-practical-bathroom-organization-ideas/pictures/17689/)_. 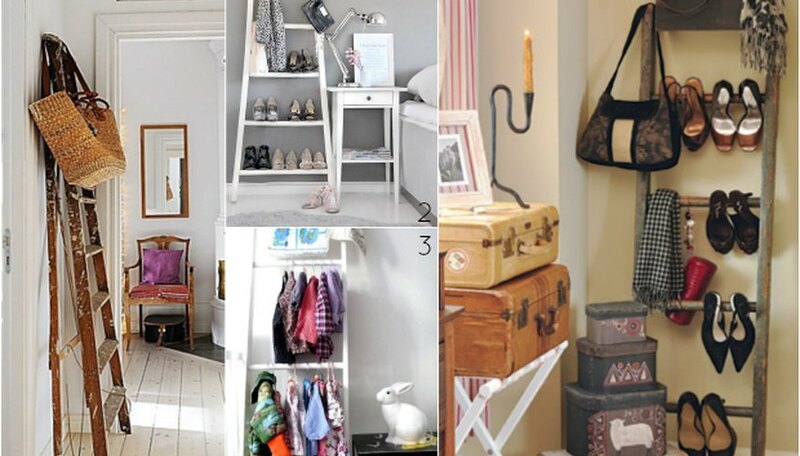 Create easy access to clothing, shoes and your favorite accessories by leaning a ladder in the corner of a room, the outside wall of a closet or open space near the entryway. Your go-to essentials will always be at an arm’s length and neatly displayed. 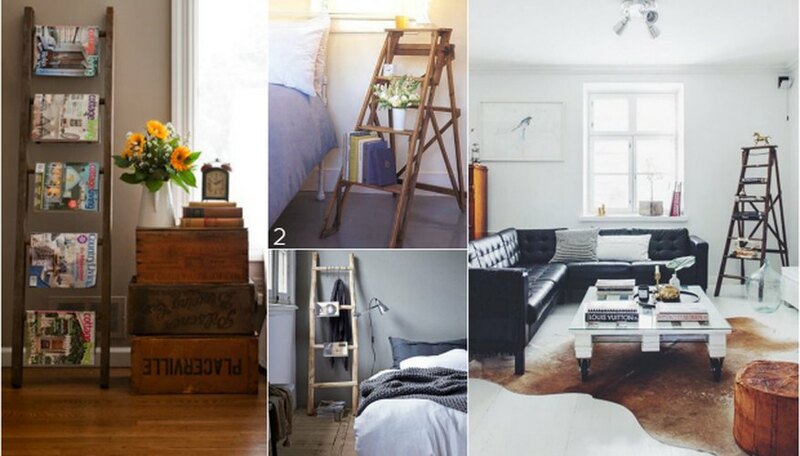 _Image sources: (http://myscandinavianhomeblogspotconz/2012/03/lovely-bright-sunny-stockholm-apartmenthtml), (http://wwwsongbirdblogcom/2014/02/20-creative-ideas-decorating-ladders/?pid=361), (http://wwwrockthathorsecom/?s=ladder), (http://wwwdrivenbydecorcom/2012/09/25-unique-ways-to-decorate-with-vintagehtml)_. When suspended overhead, single ladders transform into exposed storage for essentials like pots and pans, baskets and tins, laundry or even architectural lighting. Use them as a dedicated vertical storage solution or bring in for a special event to add a bold decorative element. _Image sources: (http://wwwapartmenttherapycom/green-style-a-ladder-as-a-dini-141529), (http://wwwlivingthecountrylifecom/homes-acreages/country-homes/16-farm-kitchen-features-we-love/), (http://unskinnyboppycom/2013/06/let-me-introduce-you-mohawk-panorama-collection/)_. Prop open A-Frame ladders to double as decorative stands. Use one indoors as a bookcase against a wall or to help delineate separate spaces. Bring them outside to use as a rustic plant stand, adding varied height to your potted plants while maximizing sun exposure at the same time. _Image sources: (http://wwwhgtvgardenscom/photo/ladder-perch-for-pots-of-kitchen-herbs-id-00000139-078c-dc4f-a1fd-17af4df40000), (http://wondercoseswordpresscom/2012/07/12/seguim-reciclant-trastos-decorem-amb-escales/), (http://jeannedarclivingblogspotcom/2012/08/flea-market-field-triphtml), (http://sweethomeandgardentumblrcom/post/75672565031/breadandolives-source)_.
Isn’t it amazing how many ways a utilitarian object like a ladder can be transformed into new and beautiful storage solutions? We hope the next time you pass by that old ladder in the garage or at a nearby sale you’ll give it another look, with creative inspiration. 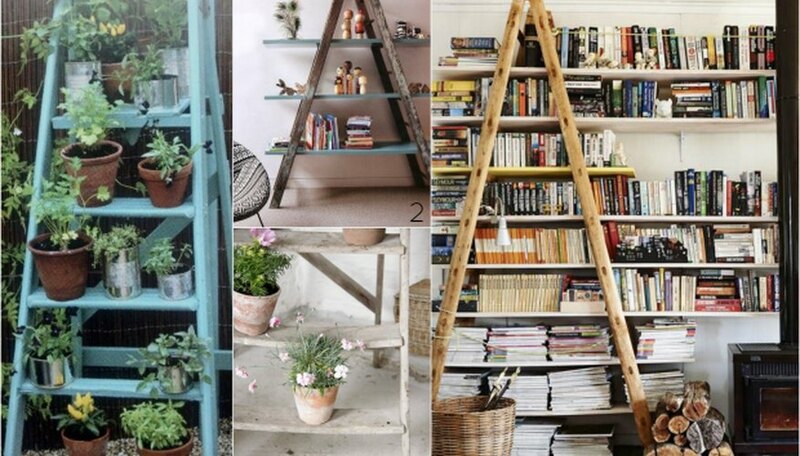 We would love to know how a repurposed ladder could be used in your home! Let us know in the comments section below. 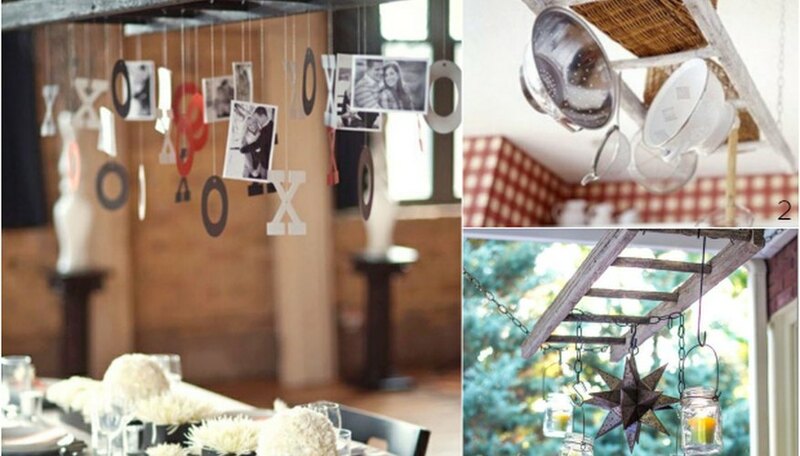 Looking for more decorative ideas? Check out [these 5 design tips](http://wwwehowcom/ehow-home/blog/desing-tips-to-add-personality-to-your-bathroom) for adding personality to your bathroom and learn how to make a gilded centerpiece using gold spray paint and pvc piping in [this spring project tutorial](http://wwwehowcom/ehow-home/blog/make-a-modern-spring-centerpiece-using-just-gold-spray-paint-and-pvc-pipe). _Keep up with Mary and Tim’s adventures in DIY, home and gardening on their collaborative lifestyle blog, [17Apart](http://www17apartcom/). Find them on Instagram ([@17Apart](http://instagramcom/17apart)) and page through delicious recipes on Tim’s food blog, [EAT](http://wwwtimvidraeatscom/)_.
Mary and Tim Vidra, the creative couple behind the lifestyle blog 17Apart.com, live and work in Richmond, Virginia. Both do-it-yourselfers by nature, they are continually in search of simple solutions for living more sustainably — sharing their ideas, tips and tricks for DIY home decor, urban gardening and cooking. How Can I Decorate My Room With No Money?